One of the most popular pumps ever made, the Jacuzzi J Pump was used in Whirlpool Bath built spas from 1990 to 2001. 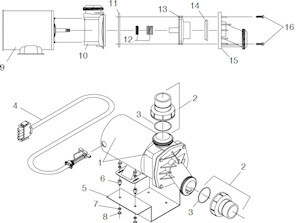 There have been a number of versions of this pump over the years; shown here are the current replacement parts available. Some older mounting brackets (shown as #10) will not interchange with the newer volutes (shown as # 15). Note: Rear Mounting Bracket (shown as #10) has part # F156000 on it. Matching Volute (shown as #15) will have part #F157000 on it. 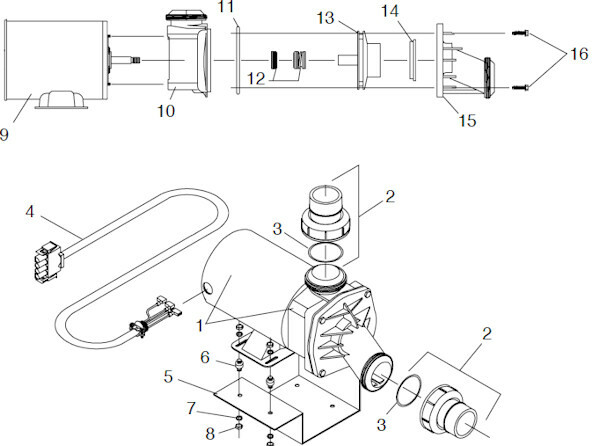 All other parts, including impeller, shaft seal, o-rings and unions, will work with any build. Note: We strongly advise not using the seal eye in this pump. While it is shown in the diagram, they are prone to deformation and binding the impeller.